Competitions will include Mehendi drawing, Singing (solo and group), dancing (solo and group), rangoli making, elocution (Tamil and English) and painting. Renaissance means re-birth, the fest was named so because we dedicated this to our re-awakening. After the untimely death of our founder chairman in 2012, there was a worry among many that MJC would wither away. But we took a vow; that we will not let it happen. Renaissance is an expression of this commitment and confidence. Renaissance was initiated with an aim to provide our youngsters an opportunity to manage an event, compete with their compatriots, and to have an opportunity to interact with a broader audience from the society around. We started this in 2013, and it has flourished since then, thanks to our children’s tremendous efforts as well as the support from several well wishers. The fest includes a variety of items ranging from literary to musical; with opportunities for students with ways with the paintbrush and who can tap their feet to the rhythm of the music. 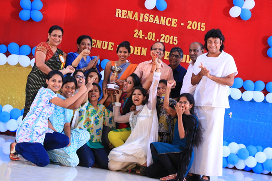 The first Renaissance held in January 2013 had participation from 100 students from around 20 colleges who competed with vigor and enthusiasm. First and Second Price winners were rewarded with gold coins sponsored by Chemmanur international jewelers. We had a distinguished panel of judges who selected the winners. 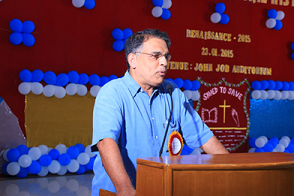 The chief guest of the event was Mr. Bobby chemmanur who gave an inspiring speech to our youngsters. Mr. Kishore sodha a renowned trumpeter played at this event for the students and stole their hearts with some popular Bollywood tracks. Renaissance 2014 grew to be a two day event; first being for school students and second for college students. For the Inter- School Event (Renaissance 14 - Junior) we had participation of 260 Students from 13 Schools. 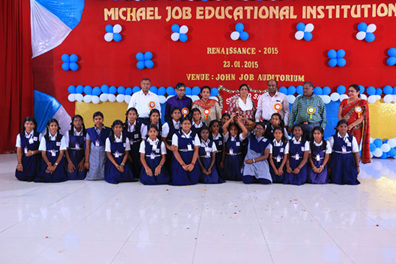 Dr Job Memorial Rolling Trophy for the Overall Championship was bagged by SSVM World School,Vellalore, Coimbatore. Renaissance -15 saw a lot more participants than the previous years. Around 150 students participated in the ‘Junior’ event 90 students from 17 different colleges participated in the ‘Seniors’. The chief guests for the fest were Rev. Jacob Thomas and Rev. James Thomas and the guests of honor were Mr B Vijayan IAS (Retd Chief Secretary of Goa), Ms Devyanni Khobragade IFS and MR Bobby Chemmanur. The Winner of the Trophy for the intercollegiate event was CMS College of Arts and Science, Coimbatore. Over the years Renaissance has seen outstanding talent from various schools from all over the state and hope to see a lot more talent in the forthcoming years.